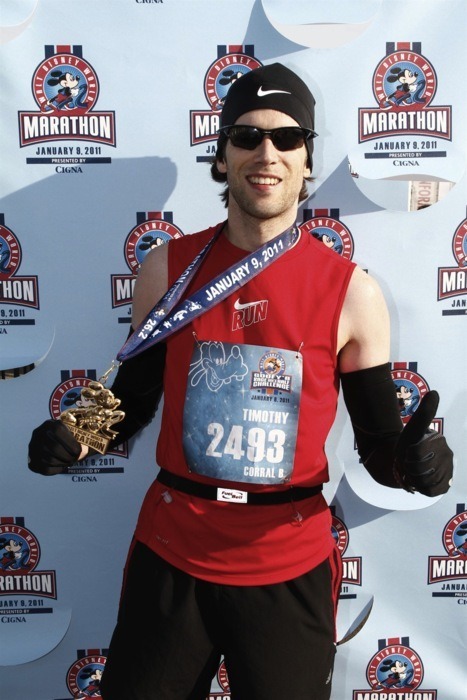 My Run: Overall, the Walt Disney World (WDW) marathon was my seventh full marathon, and my third in the last 14 weeks (Twin Cities Marathon on 10/03 and Rock n’ Roll San Antonio on 11/14). This race was originally planned as the Goofy Race and a Half Challenge, which would also have included the half marathon on Saturday, January 8th. Unfortunately, on the Tuesday before the race I came down with flu. This included a fever of 100 to 102, body aches, chills, exhaustion, etc. My family and I still traveled to WDW on Friday morning, but as of Saturday morning my temperature was still around 101. Because of this, I ended up skipping the half marathon, and really did not think the full was going to be an option either. However, late in the day on Saturday I began to noticeably feel better, and my fever broke. Even though I knew I would be nowhere near peak condition, I decided to give it a go. I decided to stick with my same strategy I had originally planned for the Goofy, to run a very smooth race and come in under 3:45 (current PR is 3:24 from San Antonio in November). On the morning of the race, I did a 5-minute warm-up run followed by 4 x 100m stride outs. 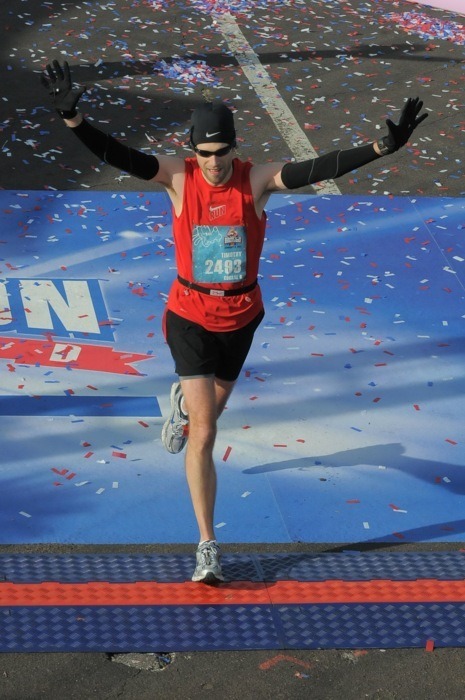 During the warm-up, I could tell that my energy level was low, but otherwise felt ok. I did have some sinus congestion and a cough, but neither of these flared up during the race. I decided to start out the race at 9:00 per mile pace and see how that felt, then drop it down into the mid 8s if things were going well. Other than a couple of unexpected potty breaks, I was able to maintain a mid 8s pace for most of the first half. My heart rate remained very low, but I did not push it at all during the first half for fear of having no gas in the second half. Weather conditions were excellent with race start in the low 40s, and very little wind. I did get cold waiting for the race, and really did not warm up until after daylight at about the halfway point (race started at 5:30am). During the first half of the race, the course winds through Epcot and Magic Kingdom, and then begins to wind it’s way to Animal Kingdom as the second half begins. After I crossed the halfway point I decided to pick up the pace a little to see what I had in the tank. I ran miles 14 & 15 just under 8 minute pace, but quickly realized I could not maintain that pace and finish. My heart rate was fine, but my energy level was pretty low. 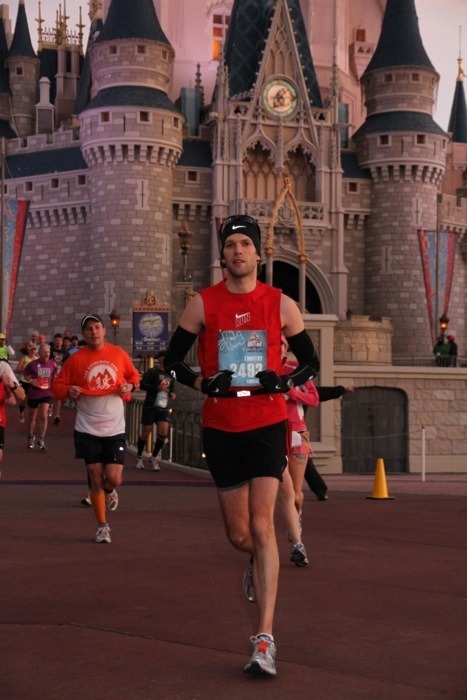 I began to really feel fatigued around mile 18 as we were coming out of Animal Kingdom, though I never bonked. Except for mile 24, I was able to keep my pace well below 9 minute pace, even though my legs didn’t have much gas. Around mile 20, my left calf started to cramp, and I began to question whether or not I could finish, but got a second wind during mile 21. I’m not sure what it says about me that I ran this marathon. I most definitely would not have tried it had my fever not broken on Saturday. Even with that, it still probably speaks to how hopelessly addicted I am to running, and specifically running marathons. Many would probably just say it speaks to how CRAZY I am. In the week+ following the race, I have been fighting lung inflammation and sinusitis. Not sure if this is a direct result of the race, or of getting rained on the next day at Universal Studios. Either way, I’m on the road to recovery, and have not run since the race completed. Overall this was a pretty un-eventful race. I wasn’t going for a PR or trying to qualify for Boston. Unfortunately most of the “news” of the event related to my flu before the race, and my subsequent lung inflammation during the next week. By far the most exciting think for me during the weekend was seeing my good friends Anthony and Pamella Tucker finish their first half marathon, and seeing my wife Olivia finish her fifth. 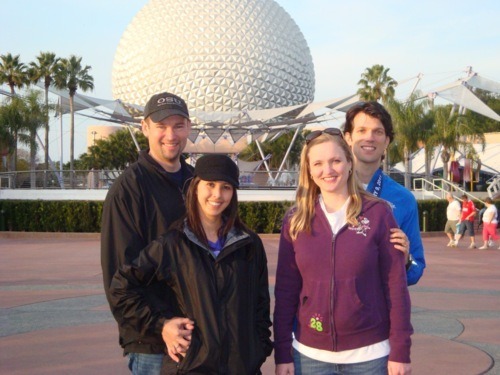 It was also pretty cool to finish the marathon, cleanup and then head to meet Olivia and the Tuckers for a day of park-hopping fun at WDW (albeit with a little limp). 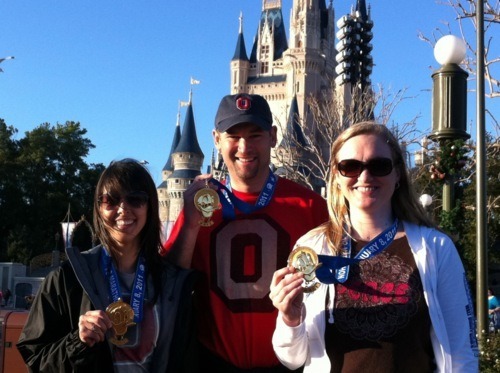 The Race: Overall, I would give that race organizers a “A” – with the caveat that the Disney event is a MUCH different race that I have ever run in. 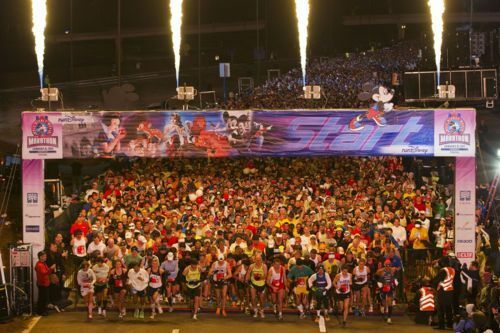 The logistics of getting to the starting line are crazy. The meeting place for the race is the parking lot of Epcot, which is where the bag drop-off area is as well. Even though I brought a warm-up suit, I had to drop off my bag and suit around 4:30am just to have time to get to the start area and do my warm-up. The walk from the Epcot parking lot to the actual start line took between 20 and 30 minutes. The race starts on one of the main thoroughfares through the Disney property just outside of Epcot (one the opposite side from the parking lot). One thing I will say is that there were PLENTY of port-o-poties at both the bag drop area and the actual starting area. One thing that I did not see was access to food and refreshments before the race. My wife had warned me about this from the half marathon, so I took my own water bottle to take my pre-race GUs. Not a big deal for me, but I know this is something a lot of people count on. On the course, there were 20+ aid stations, and all had water and PowerAde. Like most big races, the water and PowerAde were in different cups, making it easy to distinguish. The volunteers were very vocal and helpful at areas of the course. The mile markers were elevated, making them easy to see, and all included split times. PowerAde is not my favorite sports drink, but again this is personal preference. The finish area was well laid out, with plenty of room to move around. They had heat blankets and lots of food and drink. The volunteers are great and enthusiastic. The bag check location was clearly marked at the race start and finish. One criticism I have about the organization is the VERY generous minimum pace requirements (16-min per mile). This seems to create a LOT of congestion on the course, especially in the later corrals, as there are a lot of people who are taking their time, posting with characters, snapping photos, etc. I have no probably with people who walk a marathon, but the course is way too narrow through the parks to have so many participants that cannot maintain a 15-minute mile pace. The corrals are also HUGE. I’m guessing each one has over 2,000 participants. While I am generally not a huge fan of a wave start, there is simply no way to avoid that at WDW. With that being said, the large corrals nullify some of the benefit of the wave start. All marathon participants received a Champion long-sleeved technical t-shirt. While the shirt is not a high quality as other races (I’m not a fan of this brand), it is still pretty nice. 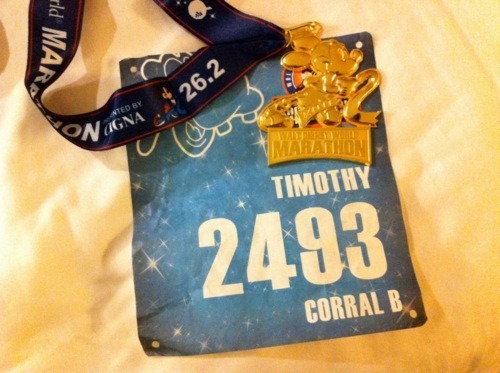 The finisher’s medal is ridiculously awesome, as it is a big, running Mickey Mouse. Packet pickup was a little unusual as you pick up your packet in one building, and then your t-shirt and goody back in another building. This seemed to take a really long time compared to other big races. The Course: The course is a very interesting animal, and I’ll try to break it down into categories. Layout: The course is flat and fast. There are a few inclines, mostly around overpasses, but overall this is a flat course. The course narrows significantly through the 4 parks, which does not seem to be much of a problem for the first 2 corrals, but can be very problematic for the later corrals that are mostly walkers. Crowd Support: Since most areas outside of the parks and resorts are not publically accessible, crowd support is concentrated to those areas. The crowd support in Magic Kingdom and Hollywood Studios was overwhelming, but basically non-existent for the rest of the course. There was a huge crowd at the finish line with large bleachers on both sides of the course. Interest Level: Running through all 4 parks is quite a thrill, but the course can get pretty dull on the roads in-between. Disney has lots of characters, bands, and other entertainment along the way, but the fact remains that you are running through Florida swampland. The course does allow you to see some areas that the public never sees, but by and large the highlight is the parks.